What did the Romans ever do for us? They gave us Bath. 2000 years later and it’s still a great night out. You wouldn’t think a converted Bakery would be a great place to go out on a Saturday unless you really enjoyed bread, but Walcot House proves this wrong. Walcot is a very unique place in Bath to enjoy live music, the best local DJ’s, great food and affordable cocktails. You can dance the night away in their old school RnB area, or enjoy the DJ in their main room downstairs. Even better, they offer yoga and spin classes during the day to work off that cheeky kebab you had on your way home last night. Want something completely different before hitting the dancefloor? Why not try out this comedy tour that takes you around bath at night. Mysteries, thrills and surprises with a great dollop of British humour awaits you when you hit the streets with these guys. Affordable and a bit of fun which can take around 90 minutes. What’s also great is you end up at the Huntsman Inn at the end which is perfect for a few locally brewed ciders and ales before hitting the cobbles towards another venue on this list. Now this place has a great vibe to it. Energetic, affordable and safe. The people at Moles do a great job with their weekly events, making sure they always have something different and exciting to look forward to. These can range from a Greatest Showman night full of cheesy Pop hits and themed drinks, to ‘Discord’ which is a heavy rock punk and metal themed night with screenings of your favourite cult films. You’re guaranteed to find an event that is perfect for you at Moles, and I bet you could even find something all of your friends will enjoy. Cancel those EasyJet tickets to Morocco, you can get a great taste of their amazing culture and nightlife down at Po Na Na in Bath. A Moroccan themed Nightclub with a very friendly atmosphere which is perfect for a messy student night out. Not to say Po Na Na is catering only for those still blessed with student discounts, they have plenty of events that hit all demographics. It’s the kind of place that gets sticky and wet by the end of the night, which many would argue is the hallmark of a great active nightclub. You won’t find yourself checking the time at Po Na Na. A name to remember, and one that’s even more fun to say after a round of drinks. Khoosoosi is a nightclub decorated with neon lights based in a vaulted cellar just near the river. It’s got an incredibly vibrant atmosphere and friendly staff. Very reasonably priced drinks and free entry on most Saturdays means this is the place to go if you’re still paying off that expensive iPhone. But there’s nothing budget about the venue at all. Very clean, professional and modern. Their Rave Fridays are a feast for the eyes. One of the country’s best comedy clubs. You will find some of the greatest talent in stand-up visiting this venue for a set. They host over 400 events a year with some of the biggest names in comedy. Many a time you will see a poster outside their beautiful grade 2 listed building and say ‘Oh...that’s the bloke off 8 out of 10 Cats!’ and you would be right. If comedy isn’t your thing then check out their event Motorcity that happens each week for an amazing evening of Motown, soul, funk and Rock & Roll. 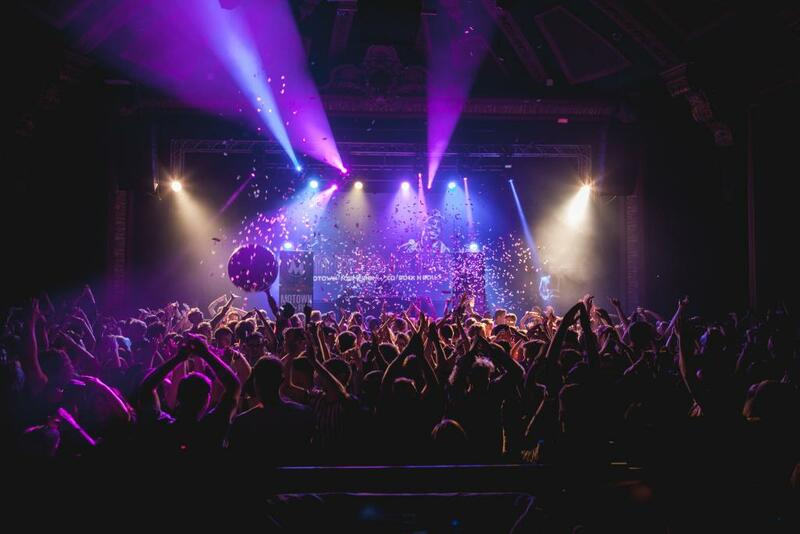 You can dance, or laugh, the night away at Komedia Bath. The choice is yours. Who says a night out needs dancing? If you’re gifted with two left feet like I am then a dancefloor is more of an obstacle than a friend. But at Spirit 13 you can have a perfect sophisticated night out without the need to worry about drunkenly trying to pull off dated dance moves from the Gangnam style days (though that is still an option with their own small dancefloor in the basement). High quality cocktails by very gifted bartenders. You will have some of the finest crafted drinks anywhere in Bath at Spirit 13. A cellar bar with a friendly atmosphere and a beautifully lit terrace at night will have you so relaxed you won’t want to leave. Great for an entire night of laughs and catching up, or a great place to grab an expertly crafted pre-drink. A classic night out. A big open basement club to enjoy with a lot of events to cater to everyone. 3 bars ensure you will never have to wait long for a drink. It’s a very fun club and one which paired with their flagship event ‘Pure Bridge’ is always a top pick for a Saturday night. It’s definitely a younger crowd than other nightclubs, with a more focused student vibe, but this doesn’t mean that it’s not for everyone. It’s always a popular choice with the locals, and the locals always know best. We all fly the nest one day, but this is the next nest you want to end up in. If you want a great cosy night out with some of the best local bands and DJ’s playing live then this is the night out for you. A small venue with a very friendly and close atmosphere. Lots of seating with different types of music. Want to chill out with a drink and listen to a local band? Go upstairs. Want to show off your dance moves to club music? Go downstairs. A versatile little place that is a must visit if you like locally sourced music. Baths best kept secret. They even say it themselves. A hidden and very creatively designed bar with multiple rooms. Each one quirkier than the next. Lots of seating creates a cosy sophisticated feel. Even the ceilings are decorated (check out the skeleton painted on the ceiling in the last room). But the best part? You can hire your very own private secret room for up to 25 people. You get your own bar and bartender, a karaoke area and a private entrance. It creates a very safe and familiar vibe which brings out more in you for a truly ‘no holds barred’ night of fun. You even get your own toilet. Living the dream. And no, you can’t take the bartender home with you. And to think, without those Romans we would never have experienced any of the above. They didn’t get to check out any of these great venues, but you can. So why not head over to www.licklist.co.uk to learn more about these top Bath nights out. See you on the cobbles!